This is a bookcase made using old carved panels, from India. 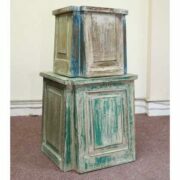 Lovely small real wood bookcase that’s been heavily distressed, and with a carved piece at the front that’s been recycled from an old Rajasthani building. 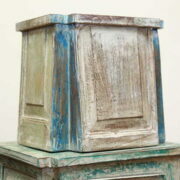 Painted in blues, creams, and pinks, the sides are made of old panels and the rest from mixed, reclaimed timbers, on a solid base.